Every year since 1907, most of the public roads on the Isle of Man close for one of the most exciting festivals in Motorsport. Created out of a desire for no speed limits and no restrictions, the Isle of Man TT features the oldest racing circuit still used today; a fabled 37.7 mile serpentine strip of tarmac known as the Mountain Course, the crown jewel of the event. Each year new machines and slight changes to the course guarantee faster speeds, and 2013 was no exception. Honda’s 24-year-old racing phenom Michael Dunlop has won the TT Championship Trophy, thanks to his four wins out of the five main events. He was granted a £10,000 cheque for his efforts. It comes as another accolade for the Dunlop dynasty, a family that has been in the sport since the universally beloved Joey Dunlop dominated in the 1980s and in years well beyond, until his tragic death during a race in 2000. Michael found victory in the Superbike, Superstock, and Supersport 1 and 2 races handily atop his Honda Fireblade–a 999cc sportbike with a pure racing pedigree, though some of its technology is available elsewhere in Honda’s lineup, such as its learner bike, the Honda CBF 125. 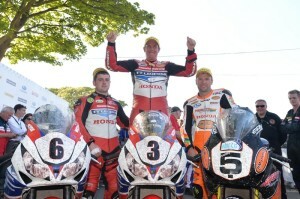 John McGuinness, also on a Honda Fireblade, set a new record by achieving a blistering 131.6 miles per hour. He was able to complete the infamously narrow, twisting, 37.7 mile road course that claimed the lives of hundreds over the years in just under 17 minutes and 12 seconds. All in all a good year for Honda Motorcycles. This year also featured the most riders involved with the ambitious TT Zero race, an event that showcases some of the most technologically advanced machines in racing. The bikes that are permitted in the TT Zero produce no emissions. Out of a field of 8, England’s Michael Rutter won the event and the £10,000 cheque on his MotoCzysz, with John McGuinness completing the 37 mile course on his Honda Mugen Shinden less than 2 seconds behind Rutter. Though this year’s Isle of Man TT was awash with speed records, danger is inherent in one of the world’s fastest sports; unfortunately, this year was no exception. Japan’s Yoshinari Matsushita had a fatal crash during a practice session, and during the first lap of the Senior TT 10 spectators were injured when Jonathan Howarth went off course. Some injuries were serious, though thankfully none were considered life-threatening.